Malaria is a life-threatening disease caused by parasites that are transmitted to people through the bites of infected female Anopheles mosquitoes. It is preventable and curable. In 2016, there were an estimated 216 million cases of malaria in 91 countries, an increase of 5 million cases over 2015. Fifteen countries accounted for 80% of all malaria cases globally (Fig. 6.2a). Nigeria accounted for the highest proportion of cases globally (27%), followed by the Democratic Republic of the Congo (10%), India (6%) and Mozambique (4%). Malaria deaths reached 445 000 in 2016, a similar number (446 000) to 2015. Malaria is caused by Plasmodium parasites. The parasites are spread to people through the bites of infected female Anopheles mosquitoes, called “malaria vectors.” There are 5 parasite species that cause malaria in humans, and 2 of these species – P. falciparum and P. vivax – pose the greatest threat. P. falciparum is the most prevalent malaria parasite on the African continent. It is responsible for most malaria-related deaths globally. P. vivax is the dominant malaria parasite in most countries outside of sub-Saharan Africa. In 2016, nearly half of the world’s population was at risk of malaria. Most malaria cases and deaths occur in sub-Saharan Africa. However, South-East Asia, Eastern Mediterranean, Western Pacific, and the Americas are also at risk. In 2016, 91 countries and areas had ongoing malaria transmission. According to the latest World Malaria Report, released in November 2017, there were 216 million cases of malaria in 2016, up from 211 million cases in 2015. The estimated number of malaria deaths stood at 445 000 in 2016, a similar number to the previous year (446 000). Africa continues to carry a disproportionately high share of the global malaria burden. In 2016, the region was home to 90% of malaria cases and 91% of malaria deaths. Some 15 countries – all in sub-Saharan Africa, except India – accounted for 80% of the global malaria burden. 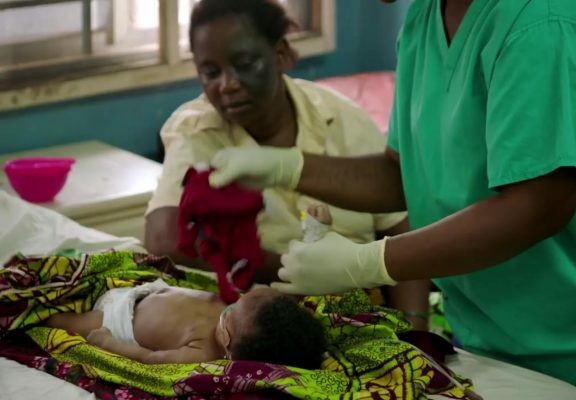 In areas with high transmission of malaria, children under 5 are particularly susceptible to infection, illness and death; more than two thirds (70%) of all malaria deaths occur in this age group. The number of under-5 malaria deaths has declined from 440 000 in 2010 to 285 000 in 2016. However, malaria remains a major killer of children under five years old, taking the life of a child every two minutes. In most cases, malaria is transmitted through the bites of female Anophelesmosquitoes. There are more than 400 different species of Anopheles mosquito; around 30 are malaria vectors of major importance. All of the important vector species bite between dusk and dawn. The intensity of transmission depends on factors related to the parasite, the vector, the human host, and the environment. Anopheles mosquitoes lay their eggs in water, which hatch into larvae, eventually emerging as adult mosquitoes. The female mosquitoes seek a blood meal to nurture their eggs. Each species of Anopheles mosquito has its own preferred aquatic habitat; for example, some prefer small, shallow collections of fresh water, such as puddles and hoof prints, which are abundant during the rainy season in tropical countries. Transmission is more intense in places where the mosquito lifespan is longer (so that the parasite has time to complete its development inside the mosquito) and where it prefers to bite humans rather than other animals. The long lifespan and strong human-biting habit of the African vector species is the main reason why nearly 90% of the world’s malaria cases are in Africa. Transmission also depends on climatic conditions that may affect the number and survival of mosquitoes, such as rainfall patterns, temperature and humidity. In many places, transmission is seasonal, with the peak during and just after the rainy season. Malaria epidemics can occur when climate and other conditions suddenly favour transmission in areas where people have little or no immunity to malaria. They can also occur when people with low immunity move into areas with intense malaria transmission, for instance to find work, or as refugees. Human immunity is another important factor, especially among adults in areas of moderate or intense transmission conditions. Partial immunity is developed over years of exposure, and while it never provides complete protection, it does reduce the risk that malaria infection will cause severe disease. For this reason, most malaria deaths in Africa occur in young children, whereas in areas with less transmission and low immunity, all age groups are at risk. Vector control is the main way to prevent and reduce malaria transmission. If coverage of vector control interventions within a specific area is high enough, then a measure of protection will be conferred across the community. AHO recommends protection for all people at risk of malaria with effective malaria vector control. Two forms of vector control – insecticide-treated mosquito nets and indoor residual spraying – are effective in a wide range of circumstances.